11029 Russian brides, 5151 Ukrainian girls, 1435 Belarus women, 2588 other Eastern European ladies. Only single women and men with serious intentions are welcomed to our dating and marriage agency. Since 2003 RussianBridesAgency.com has build the reputation of a trustworthy Russian dating site. We are providing our clients with matchmaking and dating services that help men find their perfect Russian wives. We do not offer "mail order brides". We do not sell or distribute any information of Russian women or our clients to any third parties. We provide our members with a safe and reliable place to meet Russian girls who will become future brides and loving wives. Every day there are thousands of letters from and to Russian girls and single Russian women seeking men presented on our marriage dating sites. …we add hundreds of new Russian women personals with photos and other Eastern European brides profiles to our database. Personal profiles of Russian brides that register with our dating agency go through the manual check procedure. …we reject 50-70 scammers that try to register to our dating sites. …about 50 ladies delete personal profiles from our catalogue of brides as they found their love and do not need our dating and matchmaking services anymore. Every year hundreds of our clients come to Russia to meet their brides. 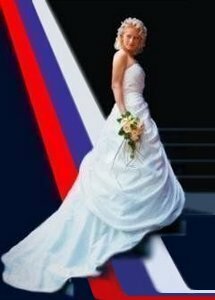 If you are serious in getting married to one of Russian women then welcome to Russian Brides Agency website offering matchmaking and dating services. We will be happy to assist you! Register Now to be able to find your perfect Russian wife. Making initial contacts with single ladies is absolutely free of charge. Mailing program of Russian Brides Agency gives you possibility to correspond with as many Russian women as you want from a brides catalogue. You sign up, put your personal profile and photos in our database, browse the Russian brides personals and send e-mail to the single women you choose. Most of the Russian brides of your choice responds when receive the messages from you. As soon as your personal profile and pictures appear in our online database thousands of ladies look at your ad and, if they are interested, send you messages. In your mailbox you can see the profiles and pictures of the brides who have sent you replies. To read all the messages in your mailbox and to write as many messages as you wish to as many brides as you wish, you need to become a full member. While corresponding with Russian girls you must also be ready for some expenses. Probably, you would like to send a gift and/or flowers to your dream girl. To join mailing program, you have to take out the monthly subscription. If you want to find the ideal Russian wife, you can order a personal search in our marriage dating agency and we will help you find a special Russian lady for you, a lady that would be interested in you and will come to the brides agency only to meet you. All the ladies that come to your profile are personally interviewed and you are send every day the list of ladies that came to your personals profile. To communicate with girls you can pay for the service of personal advisor on this site, and your Personal Advisor (professional matchmaker) will tell you the personal impression from all the girls that came to your advertisement, help you find the most suitable for you Russian girls. Your personal advisor will guide you through all the process: you will be helped to create your profile and detailed description of the girl of your Dream. Based on the information you provide and discussion with you, your advisor helps you to choose Russian girls that will be the best match for you, makes recommendations and personally introduces you to the girls you are interested in. Our personalized service saves valuable time, helps to find the best matches. Try these dating and matchmaking services and increase your chances to find a Russian wife. Good luck in your searching on this marriage dating site and dont forget to bookmark Russian Brides Agency website for later use.